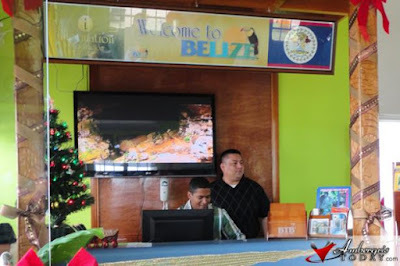 The Belize Tourism Board officially opened its Information Kiosk at the Santa Elena Border arrival area in the Corozal District on Thursday, December 15, 2011. According to Interim Director of Tourism, Javier Paradez, “Belize has seen a significant increase of 24% in overnight arrivals coming through the Northern border with an outstanding 12% being accounted for just for this year. ” Certainly, this adds to the continued strengthening of local tourism business, ultimately increasing visitor spend and length of stay in the country. As outlined in the Action Plan 2010 -2012, the BTB’s Marketing Department, through the dedicated work of the Hospitality Team successfully established this Kiosk in an effort to continue stimulating an already vibrant cultural Belize experience with the natural integration of tourism while providing a welcoming environment to the overnight tourists. With attendance from the Minister of Tourism, Civil Aviation and Culture – Hon. Manuel Heredia Jr., Mayor of Corozal – Mr. Hilberto Campos, Board of Directors and Industry Partners, it was highlighted that the establishment of this Information Kiosk at the entrance of our country from the North is the first step to activate an alluring presence to all tourists while building the country of Belize as a tourist destination. The BTB Team is proud in accomplishing another milestone for the year and looks forward to more elated initiatives in 2012. For more information on the kiosks and events from the Belize Tourism Board, feel free to contact Clive Myers, Local Press Officer and Events Coordinator at the main office on Regent Street or at cmyers@travelbelize.org.